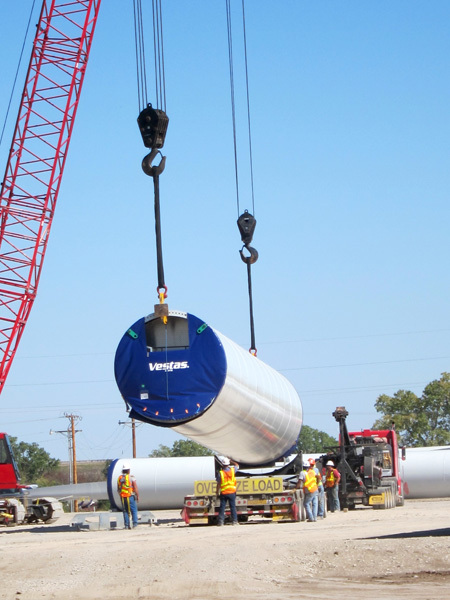 TradeWind Energy's 200 MW Caney River wind project in southeastern Kansas packed a punch when it came to delivering economic benefits to the local community. Renewable power projects in the U.S. have been much praised for moving the country further along the path to a sustainable energy future. At a time when the U.S. economy is still struggling to recover from the deep downturn of the last several years, renewable energy projects are also receiving an equal amount of praise for the jobs they are creating and the contributions they make to the revenue base of local governments. Elk County, in southeastern Kansas, has seen economic challenges for a number of years. Like many rural areas in the U.S., the county struggles to keep its youth from moving to larger urban centers such as Wichita or Kansas City. Losing residents also makes it more difficult for the county to maintain its tax base and pay for all the services, everything from maintaining roads to funding local schools. So it's no surprise that when Kansas-based TradeWind Energy came forward with a solid plan for a wind energy project in Elk County, local government officials viewed it positively. "They were extremely supportive and worked hand-in-hand with us to make the project a reality," says Matt Gilhousen, senior vice president of project development for TradeWind Energy and project manager of the $350 million, 200 MW Caney River project. "It was an opportunity for Elk County to greatly improve their financial position. The Payment In Lieu of Taxes (PILOT) we negotiated with the county will increase their annual budget by 50 percent, for the life of the Caney River wind project." Some $3 million a year will now flow to the local economy through PILOT payments and lease agreements with landowners in the county. There were other local spinoffs from the project as well: 200 workers were employed during the construction phase, and the wind power project employs 15 full-time skilled workers in an area where job creation has been difficult. "There are 3,000 people in Elk County, and everyone can see a benefit from the wind project when you look at what it contributes," says Gilhousen. "It's one of the really important factors for us as a developer—to be able to make a positive difference in a community. It's not very often that you get to make that big of a difference as the Caney River project did with Elk County." The Caney River project was a few years in the works. TradeWind Energy started doing the groundwork for the project back in 2003. "It was one of the very first projects that we started development work on. It was focused on accessing the high voltage network that is in the eastern part of Kansas." The wind resource in eastern Kansas is solid and viable for wind power, though it is not as strong as the wind in the western part. "But the transmission system is much more robust in the eastern part of the state," explains Gilhousen. "The focus of the project was to get access to a good wind resource and excellent transmission capacity. The transmission capacity was the critical component that led to the Caney River project being built." Westar's 345 kV line runs right through the project site. Power generated from the project's 111 Vestas V90-1.8 MW turbines will be moved several states away (through two Regional Transmission Organizations) to the Tennessee Valley Authority (TVA) and their power distribution system in the southeast U.S. Under a Power Purchase Agreement, all of the power produced at Caney River will be sold to the TVA. The TVA is the country's largest public power company, serving customers in nine states. The wind resource they are working with in eastern Kansas will generate enough electricity to provide power for the equivalent of 60,000 homes. "It's not as high as the average wind speeds in eastern Kansas—we're looking at the lower 40s capacity versus the middle-to-upper 40s capacity in western Kansas. But relative to the rest of the country, it's robust and a very good wind resource," says Gilhousen. Oklahoma. In many areas, the river is more of a flatwater stream. The site is primarily pasture land, with some cultivated land. TradeWind Energy arranged leases with a relatively small number of farmers and ranchers for the project's nearly 14,000 acres. Landowners viewed the project very positively, since it means extra revenue for them. "That's the case more often than not," says Gilhousen. "Farmers and ranchers welcome the additional revenue that comes off a wind project—it helps supplement their ag income." TradeWind Energy always makes a conscious and organized effort to share information about what is involved with development of a wind farm. As a sign of how mainstream wind energy has become, Gilhousen said the landowners were pretty much up to speed on wind power. When Kansas-based TradeWind Energy came forward with a solid plan for the $350 million, 200 MW Caney River project in Elk County, local government officials viewed it positively. 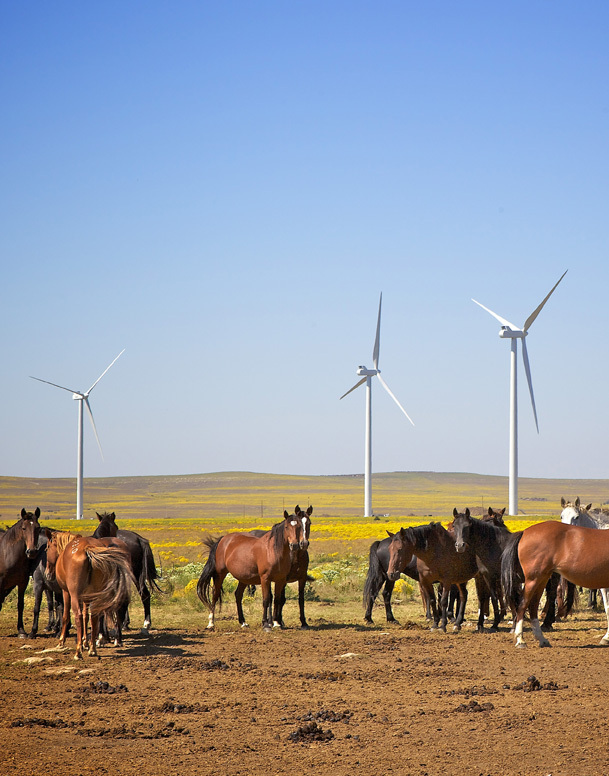 "At this point, the industry is mature enough that most of the ranchers and farmers generally already know that they have viable wind resources—like they know they have oil or gas on their property. People have probably been knocking on their doors, and they've heard the pitch and educated themselves. "They've also probably seen wind farms—they're on most of the major Interstate highways in the Midwest." The company emphasizes that wind turbines take up only a very small fraction of the land that is being leased. "Typically, it's well under two percent, but it could even be one percent or less that is actually taken out of production. But we usually start with the two percent figure, just to get the landowners' minds around a number." With TradeWind Energy being based in Kansas, and the fact that they had done another Kansas wind project (the two-phase 100 MW Smoky Hills project in the central part of the state), the company knew the ropes in terms of regulatory approvals. "Having done Smoky Hills I and II really helped pave the way for getting this project done," said Gilhousen. "Kansas is a fairly business-friendly state. But there are still a significant number of federal, state, and local permits and authorizations to be obtained, and we worked very closely with all of those parties." One distinct difference, though, was that since they were dealing with the Tennessee Valley Authority, a federal government-owned utility, they had to receive National Environmental Policy Act (NEPA) approval. "So we had to do a full-fledged environmental assessment, and that was an additional environmental permitting hurdle that we had to get over. Some of our staff had been through similar processes, but this was a first for us as a company. So it was a new challenge, but we were successful, and it was well worth the effort." As it turns out, there were no environmental issues. "The site we selected was outside the Heart of the Flint Hills, with what we thought were very suitable properties for wind turbines—and that proved to be the case, based on the results of the studies. There weren't any threatened or endangered species to be concerned with." Although all the necessary approvals were granted for Caney River, it will likely be some time before further wind project development is carried out in this area of the state. Kansas Governor Sam Brownback has expanded an informal moratorium on further wind project development in the area, to protect areas recognized as "pristine prairie". "There's an ongoing debate about any sort of development, and native grasslands or prairie was the most critical topic that was uncovered through the NEPA process," says Gilhousen. "We worked closely with the TVA and the stakeholders, primarily with the federal and state agencies, and the NGOs, to develop a mitigation plan to help offset any potential impacts by placing conservation easements on existing grasslands and doing some tree clipping and restoration of existing prairie habitat." The company also did research into grassland management and the impact of wind turbines on grasslands. "The mitigation package is something that we're really proud of," says Gilhousen. There have been similar packages developed for other wind projects in Kansas and Oklahoma, but the package for the Caney River project was more generous and well thought-out, he added. "We worked very closely with the different agencies to get the right package pulled together, and I think we were successful in doing that." There will also be ongoing work in this area. The Caney Wind River project is providing $8.5 million of the total $9.4 million in funding for a plan to protect the tallgrass prairie in Kansas. Specifically, the funding will be used to help establish conservation easements needed to protect over 18,000 acres within the Heart of the Flint Hills, restore 6,000 acres of the Tallgrass Prairie Habitat, and conduct research on its eco-system and wildlife. Once all the approvals for Caney River were in place, it was a matter of project execution, and the logistical challenges that come with that part of the project. "We have good partners and expert contractors and project managers that help us do that," says Gilhousen. "I think describing what they deal with as logistical challenges hits the nail on the head. Wind farms are complex projects, but it's very much an assembly line process, with one foundation and turbine pretty much identical to the next one—it was a matter of building 111 of them in the case of the Caney River project." There were some significant economic spinoffs from the Caney River project: 200 workers were employed during the construction phase, and the wind power project employs 15 full-time skilled workers in an area where job creation has been difficult. Gilhousen says there is a basic template that can be pulled off the shelf for construction of a wind project, but he added that each and every project comes with its own set of challenges. 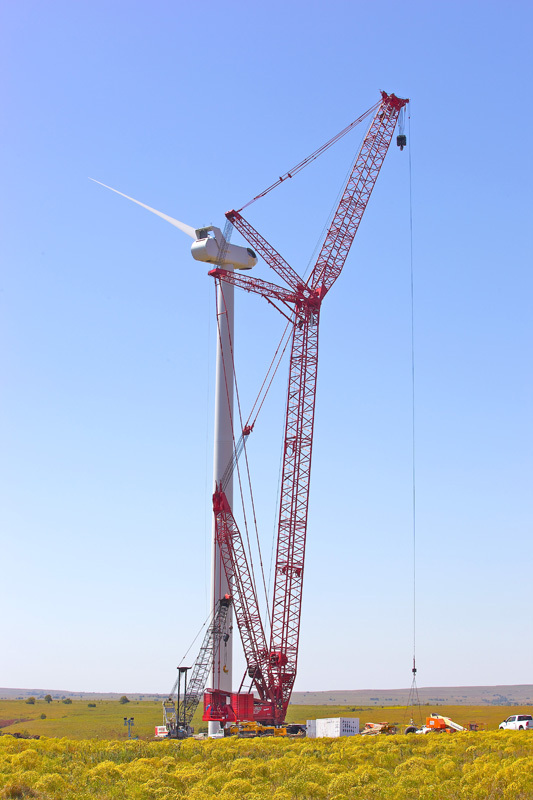 In the case of Caney River, one of the challenges was an aggressive construction timeline for the contractor, Balfour Wind Energy Constructors (BWEC), a joint venture between Texas-based Balfour Beatty Construction and Oklahoma-based Wind Energy Constructors. "But we fared pretty well and BWEC was able to meet the end of the year deadline," says Gilhousen. "There were a lot of wind days and weather days, but that's not uncommon for Kansas. We do a detailed analysis of the historical meteorology for a site and plan for those events. But you never know what Mother Nature is going to throw at you." He noted that many of the things that make for a smooth running construction project actually occur months, or perhaps even years, prior to a dozer blade hitting the dirt. "You want to, right out of the gate, try to identify any fatal flaws with a project. That includes properly prospecting and selecting a site and identifying any flaws. You want to walk through the environmental permitting, meteorology, transmission interconnection, access to the right power market and the engineering. Those are the major ones, and there could be a showstopper in any of those buckets. "The sooner you can identify them, the sooner you either come up with a solution—or cut your losses and move on to the next project." In terms of the construction of a wind project, it needs to be well-developed, with pre-planning well in place. "Having a well developed project site leads to a good base, and an on-schedule, on-budget wind project." He said all the project "partners" on Caney River—TradeWind Energy, BWEC, Enel Green Power North America, the Tennessee Valley Authority, and wind turbine supplier Vestas—worked hard to make the project a success. Enel Green Power North America Inc., TradeWind Energy's development partner, has purchased the project from TradeWind and is now its sole owner. Though it was the developer of Caney River, the role of TradeWind Energy can vary, depending on the project, Gilhousen explained. "We want to hand off a project in a well-baked condition. But that line as a developer can be kind of grey. We always complete the Power Purchase Agreements and all the primary contracts. Typically, we will initiate the turbine supply and EPC process. That is kind of where the developer hand-over line has been for us in the past. "But with each project, we seem to be going further and further. On our current project, we're very likely going to manage construction for the eventual owners of the project—and we're looking forward to doing that." Gilhousen says TradeWind Energy is not a standard development company. "We develop projects and take them well beyond what a lot of people think is the developer's role, taking on turbine procurement, EPC including the detailed engineering and long lead procurement of equipment such as transformers and switchgear. The farther we can take things, the more we can de-risk the project for the new owner and the more value is created." With Caney River now behind it, and the industry looking at the possible expiry of the Production Tax Credit later this year, TradeWindEnergy sees a busy balance of the year. It's kind of a Good News/Bad News scenario, though. The Good News is that they will be busy this year, the bad news is that they will be very busy due to the pending PTC expiry. "The development side of the business is staring the PTC cliff directly in the face right now," he says. The short term nature of the PTC creates havoc for the industry, he added. "It does not make for good public policy. If you're going to support something, support it and give it a good stable platform to work from—don't create policy that is going to result in a roller-coaster of uncertainty. "If you're trying to promote an industry and help it grow, you have to lay a solid future for whatever incentives are going to be out there—and unfortunately, we've seen the exact opposite of that."